REVIEW: Enchanting and engaging "Constellations"
Boy meets girl. Girl meets boy. They fall in love, out of love, and veer into tragedy. While we’ve seen this tale unfold a thousand times before, the show approaches it in an invigorating and refreshing new way. The show has clearly been met with great success since its London premiere in 2012, and while this may be due to the fact that audiences are knowingly walking into another love story, nothing can really prepare you for the surreal experience that is Constellations. Do not let the minimalistic cast and set fool you. Constellation’s script is a powerhouse in itself, and Red Turnip just happens to have the sets and talent to not only back that up, but elevate it completely. Upon entering the space, you immediately notice the long lines of nylon stretching across the room. In between these lines is the stage, which is comprised of various jagged and disparate forms, each topped by a shag carpet. Set designer Ed Lacson explained his use of said materials: none of the lines meet, just as the characters are never on the same page. The pieces of stage are also covered in carpeting, so as to soften the play, due to the sharp dialogue. John Batalla’s lighting is as alluring as it has ever been, the lights constantly dancing on the stage, bringing the two characters together as efficiently as it brings them apart. Our two characters have rather unconventional jobs. One is a beekeeper, and the other is a theoretical physicist. 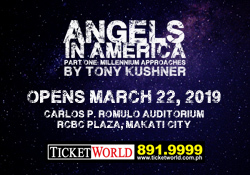 The contrasting personalities and jobs of Roland (JC Santos) and Marianne (Cris Villonco) are standard procedure for a two-hander, including the exploration of their differences throughout the show, but playwright Nick Payne takes those ideas, and in turn, the audience, to a completely new place. Marianne brings up the multiverse: a theory that postulates the existence of infinite parallel universes, in which innumerable developments take place at the same time. The characters’ professions reflect the contrast between the ideas that this universe is the only one in existence, and that there are infinite possibilities within the multiverse. JC Santos showcases great talent here, bringing a delicate balance of passion and boyish charm to Roland. Cris Villonco truly shines in Constellations. She masterfully acts out the complex and fast-paced script, and with incredible control over her expressions and emotions, can laugh boisterously in one scene, only to burst into gushing tears mere seconds later. Nick Payne’s play is the most intricately woven I have ever seen. Not only did he make a relatively simple story and take it down several paths, but he rearranged them in a way that highlighted the contrasts of the characters in their various universes. Initially, the events may seem to take place in random order, but by the end of the show, you realise that Payne has exacted specific emotions at specific times, for specific reasons. The playwright is truly a master of his craft. Rem Zamora has done a fantastic job with Constellations. One particular scene stands out among the many stand-out moments in the show, and it involves the two leads having a conversation. Only this is no ordinary conversation, as they communicate purely through sign language. A decision that Zamora made the day before the show’s first preview. For what felt like a rather lengthy, yet riveting several minutes, Santos and Villonco rehashed a previous scene that made me feel conflicted. The two actors’ body language, coupled with the sign language, triggered my deepest emotions. I say conflicted because while I was enthralled with this scene. I felt this incredible urge to smile from ear to ear from pure astonishment. Constellations is no ordinary play. It takes the most basic of concepts and flips it on its head. Several times. The play teems with vibrancy and tension, and has coalesced into one of the most engaging shows I have ever experienced. It was a spectacular production, and while it is only the second show I have seen from Red Turnip, I can say with utmost confidence that the company is paving a new path for Philippine theater. They have a firmness of purpose, and the company’s will to take risks without pandering to audiences is bound to take them to even more exciting places. *Featured image taken by Erickson dela Cruz. Previous REVIEW: Toons behaving badly in "Dog Sees God"
Next REVIEW: Perfect synergy in "Opera"